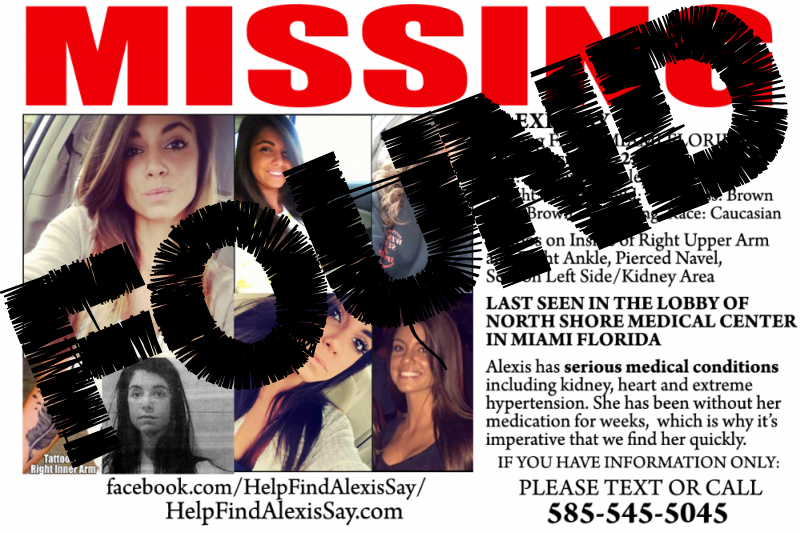 Alexis Say was last seen leaving the North Shore hospital in Miami on 01/23/2017. She is currently in very poor health and time is incredibly important. This GoFundMe is to raise money so that we can find Alexis and bring her home safely. Her mom, Jennifer Say, will not be able to work while she is searching for Alexis in Miami, so the money raised would help with her airfare, hotel, and any other expenses that will help her find her daughter. Thank you so much for anything you are able to give-- your support is deeply appreciated! From Jennifer, "I don't usually post personal or dramatic things but I'm looking for any help that might be out there, whether it is prayers, connections or avenues I haven't explored. My daughter, Alexis Say, is currently missing in Miami. She has no ID, no cell phone, no vehicle, no access to money and is in poor health. Please, at the very least, PRAY! and if you happen to know anyone in the Miami area who might be able to help, please let me know. It devastates me to share this. This is my baby. I'll take any help I can get." Thinking and praying over a beautiful young woman. WNY Love, Prayers, and Positive thoughts with Alexis and her family!